The occurrence of unwanted hair growth in women is not a subject that is readily discussed, for fairly obvious reasons. Many millions of women receive unwanted hair growth on the legs, underarms and bikini line and deal with it routinely as a part of their normal beauty regime. For more than 40%, however, unwanted hair growth in women can amount to a distressing, often daily action of shaving, plucking and waxing areas of the body that would usually be smooth, like the face, chest and abdomen. Stress is cited as a bringer of many problems in the body. Each person handles stress differently, but often, physical symptoms can manifest in the form of acne, headaches and hirsutism. 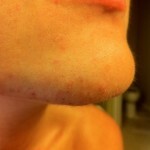 Unwanted hair growth in women on the face can be difficult to bear. Almost all of us will pluck our eyebrows within the beauty regime, but how many of us could deal with a beard or excessive facial hairs? In the most extreme cases, these women must perform a shave each day to cope with the unwanted growth of facial hair. This can result in depression and can lead to confidence issues; sometimes to agoraphobia. There is a permanent solution for unwanted hair growth in women – Electrolysis. Electrolysis has been recognised for more than 100 years as the only permanent hair removal method. Using a skilled and qualified electrolygist can be the answer to freedom from unwanted hair growth in women, permanently. Clinique Matrice is a discreet, Brisbane-based clinic run by Elaine Marley D.R.E. She began her career in Electrolysis more than 25 years ago in the U.K. and has helped hundreds of women to achieve freedom from unwanted hair growth. Whether you have had enough of routine plucking, or are looking for a permanent solution to a severe case of hirsutism, visit Elaine in her stylish clinic for a free consultation – or visit the website, full of interesting facts and information for further reading. Contact Elaine to book your free consultation.